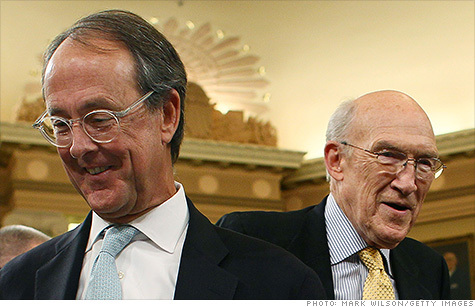 Erskine Bowles and Alan Simpson, co-chairs of President Obama's debt commission, launched a new campaign called Fix the Debt, One goal: Get 10 million signatures calling on Congress to act. NEW YORK (CNNMoney) -- A new campaign launched Tuesday aims to create public support for lawmakers who have been too afraid to back a bipartisan debt-reduction plan. A key goal of the Fix the Debt campaign is to get 10 million signatures for an online petition that will call on Congress to pass a comprehensive long-term plan by July 4, 2013. Fix the Debt was created by Erskine Bowles and Alan Simpson, who co-chaired President Obama's debt reduction commission in 2010. Besides doing outreach to educate the public, the campaign will encourage lawmakers to use the Bowles-Simpson plan as a starting point for their negotiations this year and next. That plan would reduce debt by $4 trillion over a decade by cutting defense and discretionary spending, curbing federal entitlement costs and reforming the tax code. It garnered a majority of votes on the presidential commission -- 5 Democrats and 5 Republicans and one independent -- but not the supermajority required to send the plan to Congress for a vote. A main criticism of Bowles-Simpson had been that it was not written in legislative language -- which is where the rubber meets the road in terms of the details of any proposal. Now, however, a legislative version is circulating among some members of Congress, who are offering feedback, Bowles said. The original 66-page report has morphed into a more than 600-page-bill. Among the campaign's core principles is that any final debt-reduction plan must affect all parts of the budget, preserve economic growth and protect the needy, said Fix the Debt co-chair Ed Rendell, the former Democratic governor of Pennsylvania, at a press conference. The idea is to make it safe for Republicans to consider raising more revenue without fear of political blowback and for Democrats to consider reducing entitlement and other spending. "It's necessary to create an environment where it's not only good policy to sign such a plan but good politics as well," said Rendell, who will work alongside former Republican Sen. Judd Gregg, the campaign's other co-chair. The Fix the Debt campaign has also created a CEO/Business Leaders Fiscal Leadership Council, to which more than 100 of the Fortune 500 companies have signed on, Bowles said.